OVERVIEW: From the visionary imagination of filmmaker Henry Selick, director of The Nightmare Before Christmas, and based on the award-winning novel by Newbery Medal winner Neil Gaiman (The Graveyard Book, Sandman) comes the remarkable handmade, stop-motion animated feature film Coraline, available on Blu-ray™ Hi-Def combo pack, 2-Disc Collector’s Edition DVD and single disc DVD July 21st, 2009 from Universal Studios Home Entertainment. While all editions feature both the 2-D and 3-D versions of the film and four pairs of 3-D glasses, the Blu-ray™ Hi-Def and 2-Disc Collector’s Edition DVD also include a digital copy of the movie, as well as an astounding array of bonus features that take you inside the intricate hand-crafted world of this incredibly unique film. The Blu-ray™ Hi-Def combo pack also includes a standard definition DVD of the film, as well as even more bonus features, including additional filmmaker interviews and behind-the-scenes exclusives within Universal’s U-Control and BD-LiveTM features. SYNOPSIS: 11-year-old Coraline Jones (voiced by Dakota Fanning) has just moved with her parents (Teri Hatcher and John Hodgman) to a new home in Oregon . With no friends and her parents distracted by work, the feisty and adventurous Coraline sets out to find some excitement in her isolated new environment. She is befriended—or, as she sees it, pestered—by a local boy close to her age, Wybie Lovat (Robert Bailey Jr.) and visits her older neighbors, eccentric British actresses Miss Spink and Miss Forcible (Jennifer Saunders and Dawn French) as well as the arguably even more eccentric Russian, Mr. Bobinsky (Ian McShane). Just as she’s beginning to think her new home is utterly uninteresting, she uncovers a secret door which leads to a parallel existence much like her own life—but much better. The adults, including the solicitous Other Mother (also voiced by Teri Hatcher) welcome her warmly. And Coraline gets far more attention there—even from the mysterious Cat (Keith David). She begins to think that this Other World might be where she truly belongs. But when her wondrously off-kilter, fantastical visit turns dangerous, Coraline must summon all her resourcefulness, determination and courage to get back home—and save her real family. 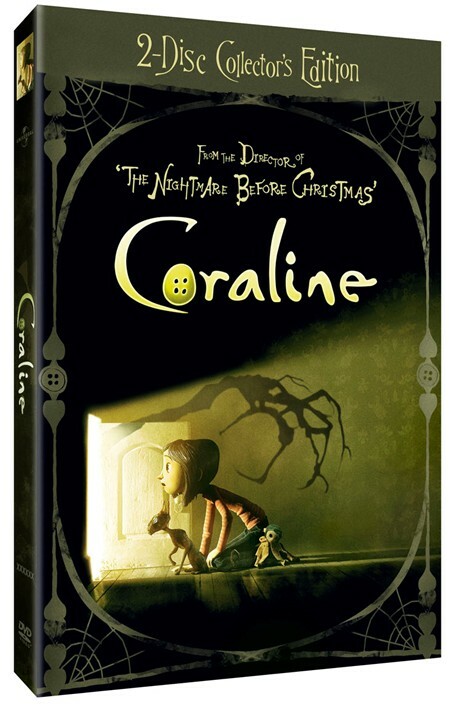 DVD: Coraline 2-Disc Collectors Edition is presented in anamorphic widescreen enhanced for 16:9 TVs with a 1.85:1 aspect ratio preserving its theatrical release ratio. Looking exceptionally beautiful. I can only imagine how much better the film looks in high definition The video is complemented with a Dolby Digital 5.1 Surround Sound in English, Francais and Spanish with English, Francais and Spanish subtitles. The picture looks very clean as is always the case with every of the Universal Home Entertainment transfers to DVD. The sound also is excellent, it was hard for me to find any type of defects in terms of video and sound. Coraline 2-Disc Collectors Edition includes both 2-D and 3-D versions of the movie with four pairs of 3D glasses. In terms of special features this release includes five quality featurettes that are worth the price of the DVD. The first one is a feature commentary with Director Henry Selick and Composer Bruno Coulais. It also includes deleted scenes and a featurette called "Voicing the Characters", in which the cast talk about how their characters were brought to life. Finally the DVD includes the featurette "The Making of Coraline" which I found to be one of the most interesting documentary in this release. It is amazing to find the details on how this masterpiece was created, definitely a must watch special feature. Overall Coraline is one of those good quality films that rarely come around. The film is just a masterpiece and to me is in the same category as the "Nightmare Before Christmas". A DVD that definitely needs to be in everybody's collection. English 5.1, French 5.1 and Spanish 5.1 (Dolby Digital). The Making Of Coraline – Director and screenwriter Henry Selick hosts this behind the scenes feature about how this hand-crafted, stop-motion animated film was made.